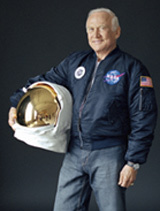 Buzz Aldrin was born in Montclair, New Jersey on January 20, 1930. His mother, Marion Moon, was the daughter of an Army Chaplain. His father, Edwin Eugene Aldrin, was a Colonel in the Air Force, a ScD from the Massachusetts Institute of Technology (MIT) and an aviation pioneer who later became the Commanding Officer of the Newark Airport in New Jersey. Buzz grew up in New Jersey and after graduating one year early from Montclair High School he was educated at the US Military Academy at West Point, graduating third in his class with a BS in mechanical engineering. He then joined the Air Force where he flew F86 Sabre Jets in 66 combat missions in Korea, shot down two MIG-15’s and was decorated with the Distinguished Flying Cross. After a tour of duty in Germany flying F100’s, he went on to earn his Doctorate of Science in Astronautics at MIT and wrote his thesis on Manned Orbital Rendezvous. Selected by NASA in 1963 into the third group of astronauts, Aldrin was the first with a doctorate and became known as “Dr. Rendezvous.” The docking and rendezvous techniques he devised for spacecraft in Earth and lunar orbit became critical to the success of the Gemini and Apollo programs and are still used today. He also pioneered underwater training techniques, as a substitute for zero gravity flights, to simulate spacewalking. On July 20, 1969, Buzz and Neil Armstrong made their historic Apollo 11 moonwalk, becoming the first two humans to set foot on another world. They spent 21 hours on the lunar surface and returned with 46 pounds of moon rocks. An estimated 600 million people, at that time the world’s largest television audience in history witnessed this unprecedented heroic endeavor. On November 16, 2011, Dr. Aldrin was awarded the Congressional Gold Medal, the nation’s highest civilian honor. As one of the leading space exploration advocates, Buzz continues to chart a course for future space travel and is passionate about inspiring the younger generations of future explorers and innovators. Aldrin recounts episodes in his life that influenced his choice to become part of the space program. He briefly describes how he got his nickname and incidents from his childhood; his first airplane ride; his time at West Point and as an Air Force pilot; joining NASA; and his missions in the Gemini and Apollo programs, including the lunar landing. Overall, the telling is entertaining and informative. A chronology of milestones in the history of flight is appended. Realistic paintings help describe the events mentioned in the text. Old-school moonwalker Buzz Aldrin teams up again with former Hugo and Nebula Awards nominee John Barnes to pen another near-future SF tale focused on the fate of the U.S. space program. The book's protagonist, Scott Blackstone, is a technically accomplished and charismatic retired astronaut who runs a foundation called ShareSpace, whose mission is to send everyday citizens into outer space. A radio beacon from an unknown world leads an astronaut to disaster on the Moon -- and his son far beyond that as he searches for the key to the mystery of Tiber, a civilization who left artifacts in the solar system some 9,000 years ago, with sufficient impact on human affairs to explain some odd references in the Bible. The villains of the book are not the aliens, but the benighted politicians with the minds of accountants who won't fund the necessary scientific derring-do to save the world -- apparently an affliction which alien astronauts also have to bear.